Linen has some strong attributes that place it high on the list of eco-friendly fabrics. With this as our starting point, we have formulated a simple approach to sustainability. The Flax plant; used to create linen yarn, growing in Europe. From flax to final yarn, linen is an environmentally friendly alternative to other fibers. Each hectare of flax grown captures 3.7 tonnes of CO2. Linen works as a rotation crop; when swapped on land every 6 - 7 years it can boost soil quality, and increase yields of the next crop. If linen was replaced with cotton cultivation it would require an extra 650.000 million cubic meters of water. 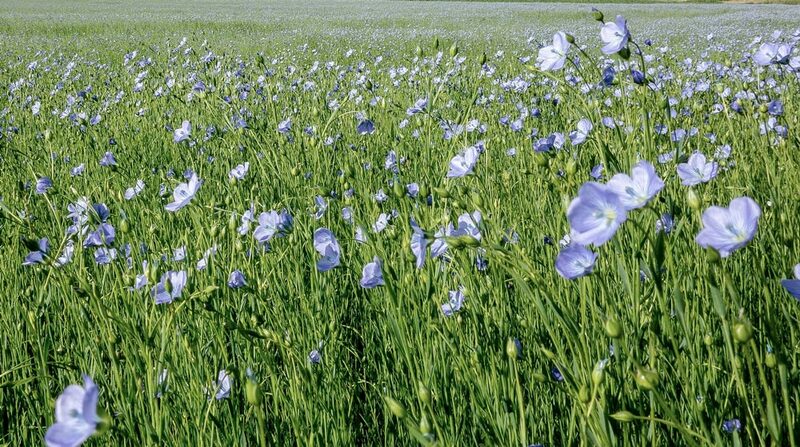 Flax crops do not require irrigation (extra water), the crop can grow with rain fall alone. Today over 200 acres of organic flax are grown in Europe. Providing traceabilty from fiber to woven fabric (GOTS label). Awareness; Our first aim is to be aware of the environmental impact of each of our manufacturing processes. With this information, we can prioritise our efforts. Inquiry; We're making it a priority to investigate and stay up to date with changes within our supply chain. Staying up to date helps us identify new opportunities for change. We review other companies in other industries to see if we can learn from their experience. Trialling and testing; We are Collaborating with others and making time for trials within our process. This helps us drive change into our everyday work. We take water from our own source. When processing yarn and fabric we use water which has filtered through basalt rock and is drawn from over 100 metres below ground. This water is naturally soft with no impurities which is important for the processing of linen. 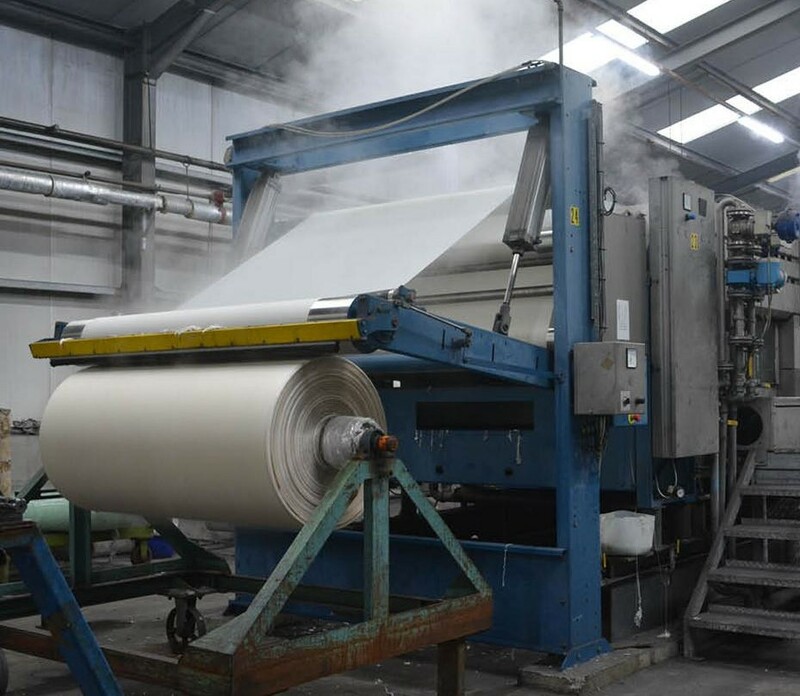 It is used in our preparation, dyeing and softening processes and is constantly monitored. We offer a range of finishes, from pristine to the most casual soft hand. Washed linen has a particularly nice casual appearance and texture and many designers like to wash / launder the fabric to enhance that relaxed feel. Laundering linen can also reduce creasing and allows linen to recover faster when creased. Water used in our process is monitored and treated before it goes back into the local water system. Our strategy is not only to ensure our processing is of the highest quality, but also to look at other aspects of water usage to see how we can lower our consumption and reduce where 'grey' water is produced in our process. Our approach is: Maintain a work practice that keeps the use of chemicals to a minimum, and drive the trial and uptake of innovation from our dye supply chain. To reduce the amount of water required in processing and to recover heat from waste waters. Pad Dyeing; Using this method, the linen is run through rollers after a trough of dye, then allowed time to react before washing. Only dyestuffs with 90% plus fixation are used. This ensures the least amount of water possible is used in the dyeing and washing process. Tumbled finish; This finishing process allows us to produce laundered finish fabric without using water. The system simulates the churning of a laundering process in tubes of fast moving air. Water Treatment; All our waste-water is pumped to the local government treatment centre where it is analyised with tight controls on discharge impurities. ‍ Maximize purchase of sustainable energy. All our electricity used at our Kells site is air generated. We also use LPG gas and are currently testing Bio LPG produced from renewable sources. Packing materials used contain recycled materials. Effluent disposal is to a local government treatment centre and is reviewed monthly to ensure tight standards are kept.